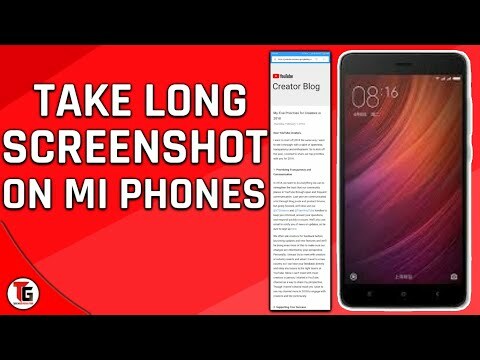 hi, friends you are most welcome to tech generator channel and todaY IN THIS VIDEO I am going to tell how to take a long screenshot in redmi note 4 which is running on miui 9.
as you can see on screen now this also work on other mi phones which were running on miui 9 without wasting your time let start the video. if you want to take a screenshot in redmi note 4 so you have to press volume down button and power button simultaneously so you can take a screenshot but it will take that part of the screen which is being shown on screen. if you want to take a long screenshot in xiaomi phones just take a normal screenshot and then click on screenshot pop up and then choose scroll after that it will automatically scroll the page. at which place you want to take a screenshot and then click on the done button after that your screenshot will get saved in your phone gallery. if you double tap on it so it becomes screen size and it will save in good quality and I hope you like this video and subscribe to this channel because we upload videos like this one that is very helpful for you. if you want more video to like this pls comment.